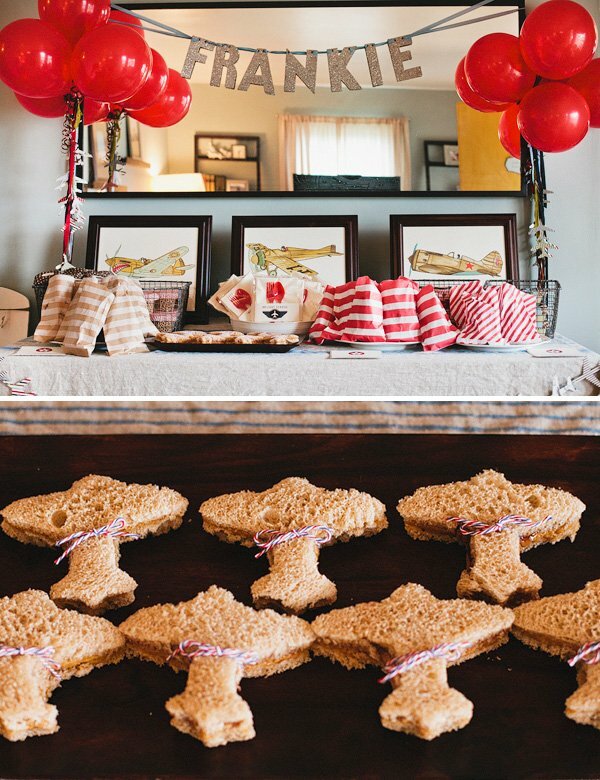 Simply put… this party is SO stinkin’ cute! 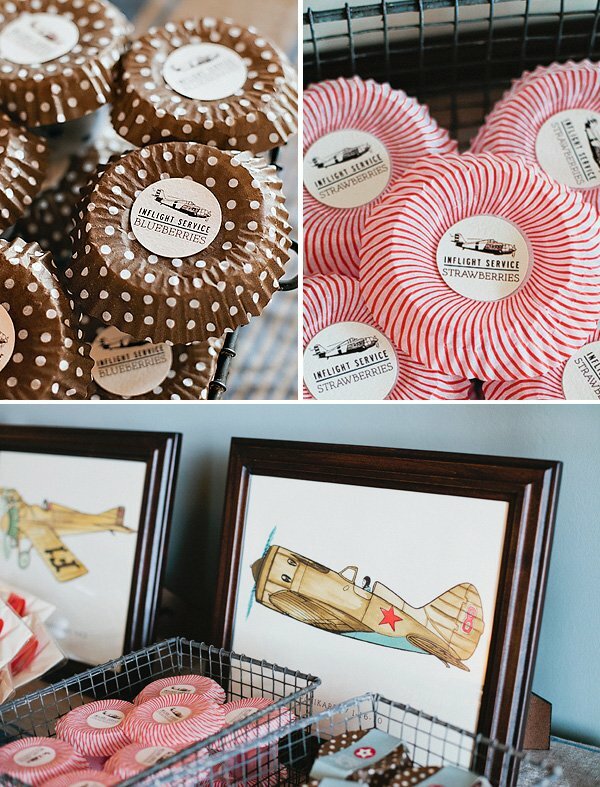 The girls from Posh Paperie (Karrie and Elizabeth) seriously outdid themselves on this super creative and stylish VINTAGE AIRPLANE Birthday Party, which also happened to be the first birthday party celebration for Karrie’s adorable son. 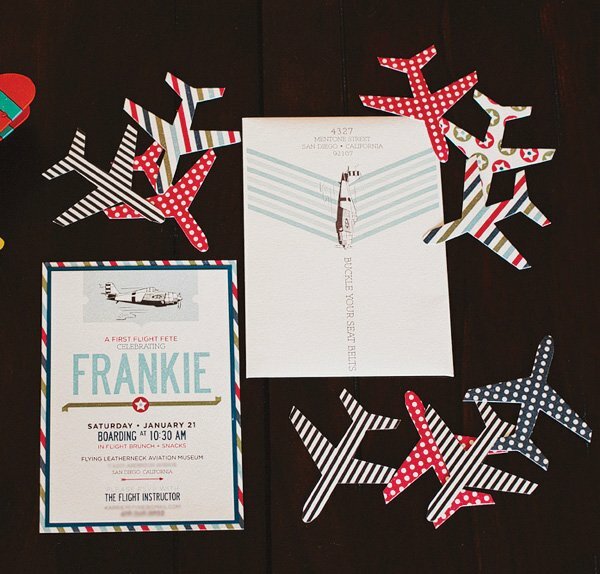 Coming from talented stationery designers, it’s no surprise that the paper details from this party are seriously spectacular – from cool themed invitations with airplane confetti on board to brunch goodies and utensils cleverly packaged up for “Inflight Service”. 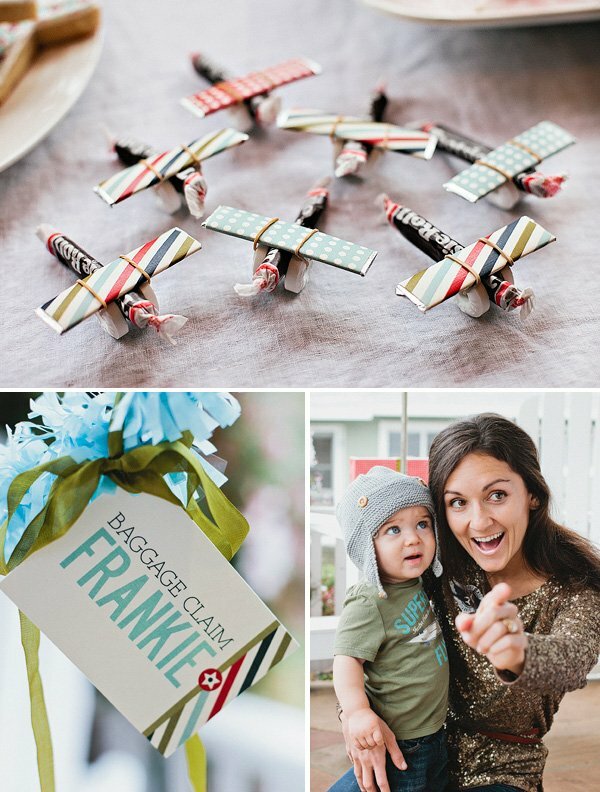 Even the DIY candy and gum “airplanes” were embellished with coordinating paper! 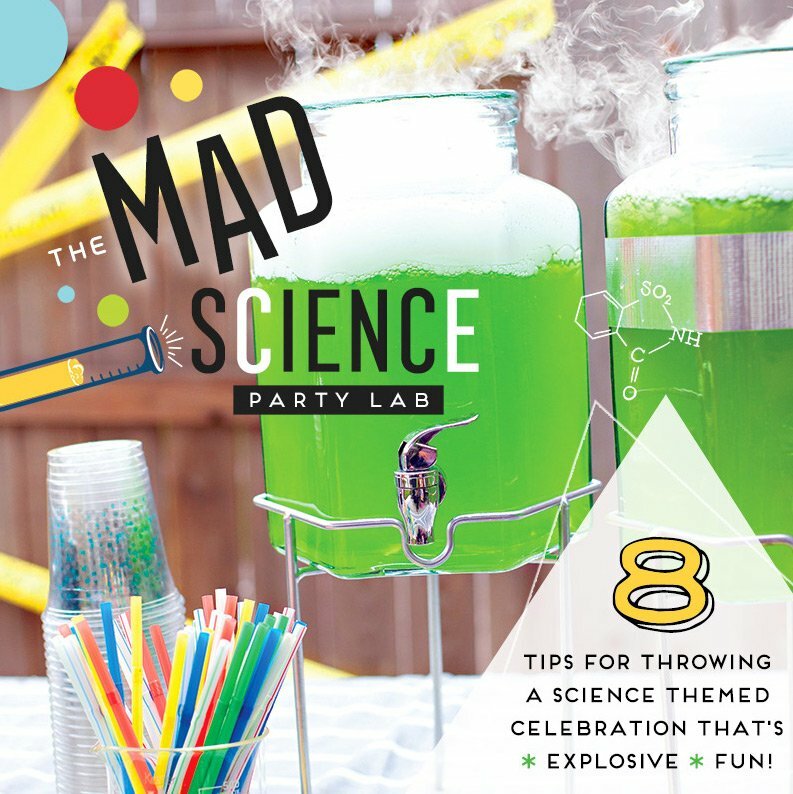 Ready to check out ALL the fun party pictures and details? Buckle up and enjoy the ride…here they come! 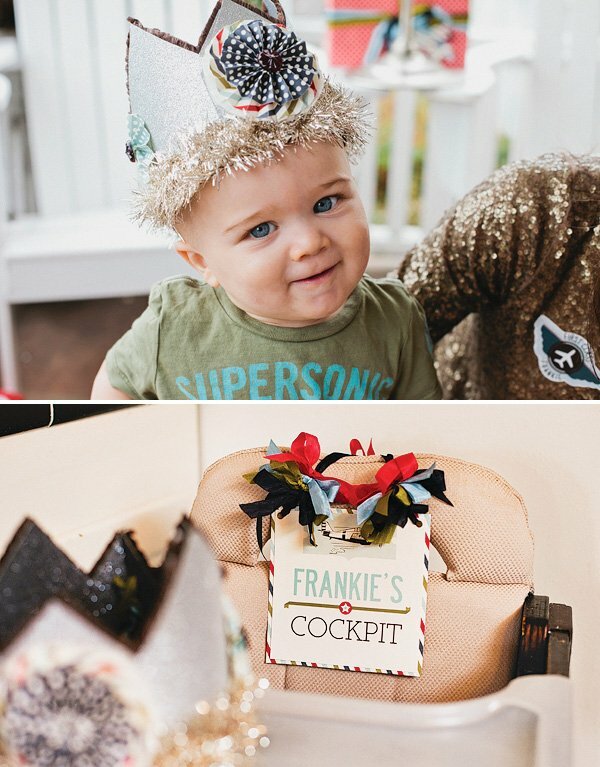 “Sweet little Franklin, (son of Karrie Pyke – 1/2 of Posh Paperie) celebrated his first birthday in January 2012. Karrie, being an amazing designer, wanted to come up with a fun party concept – that was somewhat ‘different’ and also not the typical ‘kid’ color palette. 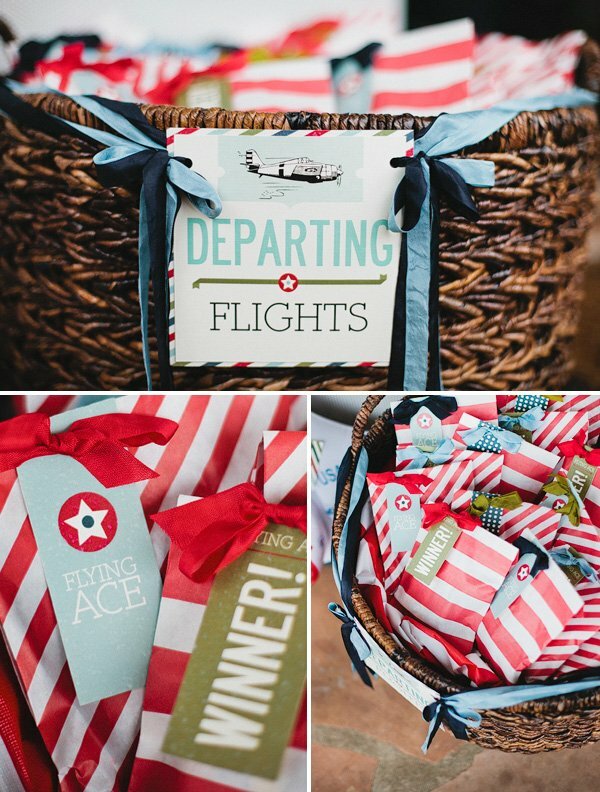 So, she decided on an “aviation” theme, and picked a fun palette of cream, red, navy blue and army green. The original plan was to have the party at the Miramar Aviation Museum in San Diego – where the entire yard of the museum is filled with old airplanes & a grassy lawn with tables. It would have been the perfect location for the party, and that is how we planned the decor. Unfortunately, on the day of the party, it RAINED! So, we had to come up with plan B. Having the party at home wasn’t Karrie’s first choice, but she did an amazing job of pulling everything together! 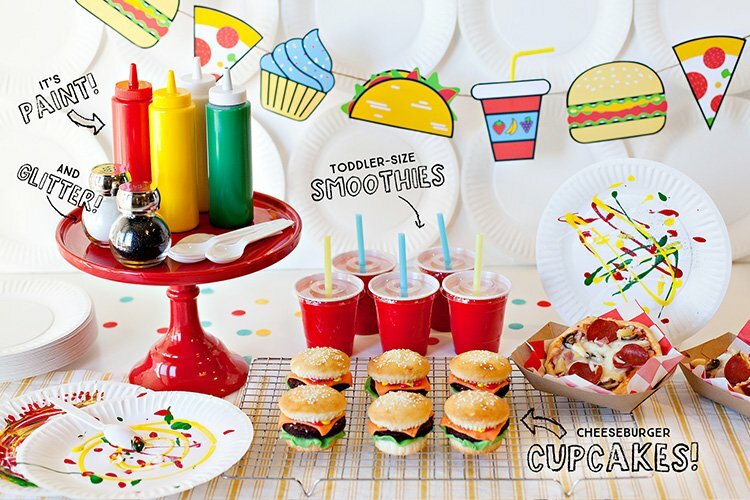 We (Posh Paperie) designed all of the fun paper products (of course!) 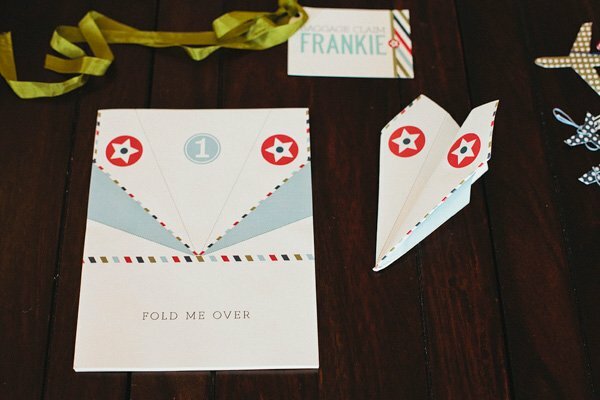 – starting with his invitation – complete with custom airplane confetti! 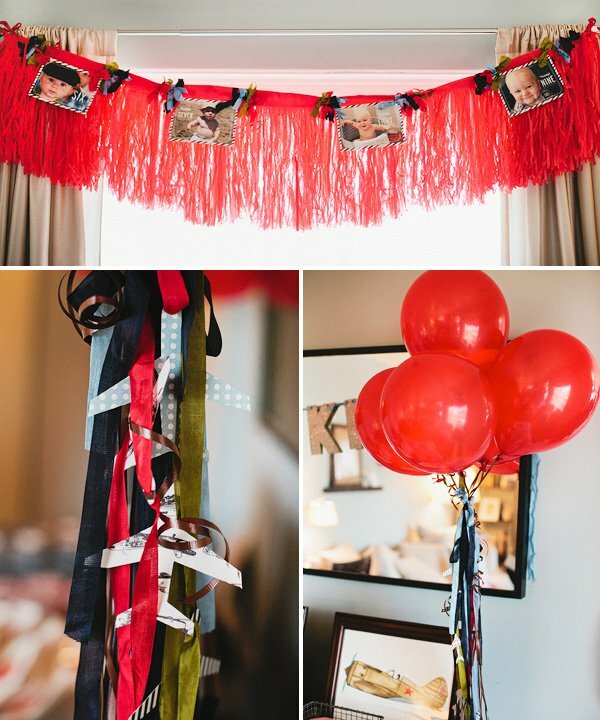 We made banners (hanging photos of his first year – each month – on red fringe) to hang from the windows, fun labels for all of the food, and even airplane ‘confetti’ banners – strung together and tied with baker’s twine bows. The food was a serve-yourself brunch style meal: breakfast burritos (with all the fixings! ), fruit cups, breakfast breads, applesauce and a drink bar (coffee, juices & soda). 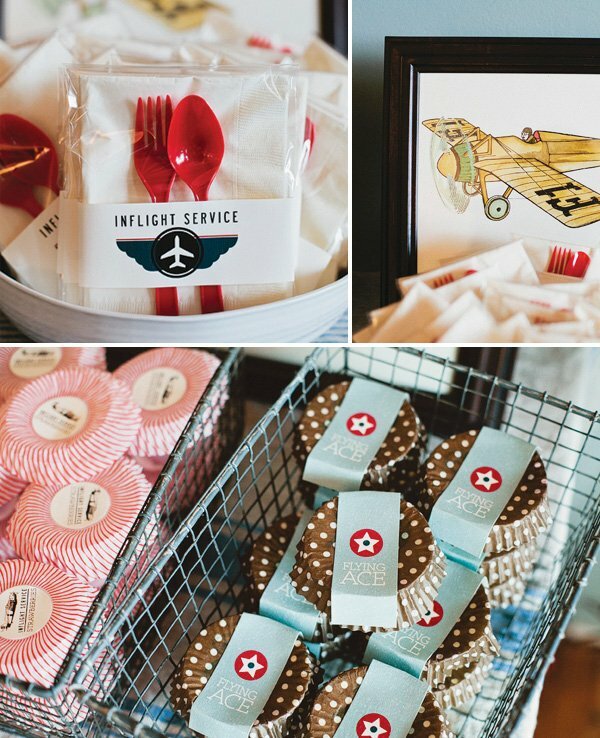 Everything was labeled in the aviation theme (even the silverware!). 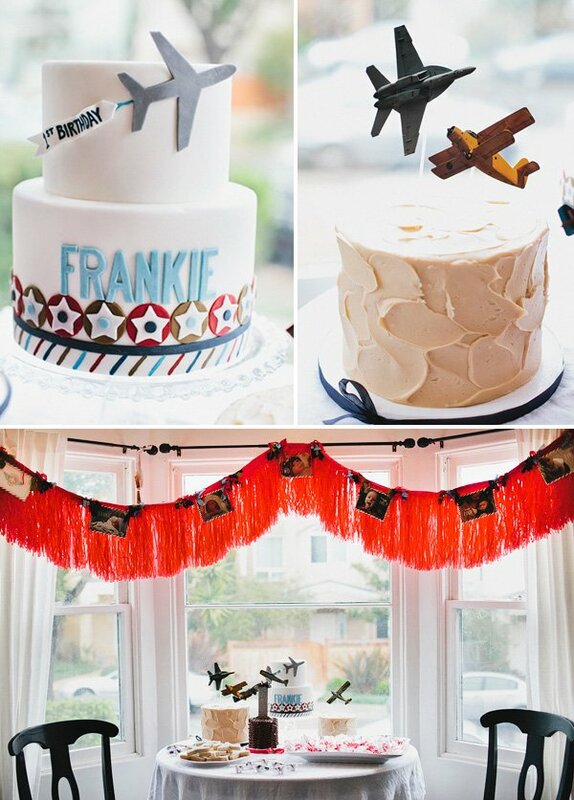 The dessert bar was courtesy of Sweet & Saucy – 2 different cakes (plus one tiny ‘smash’ cake for Frankie), as well as custom cut & patterned sugar cookies. 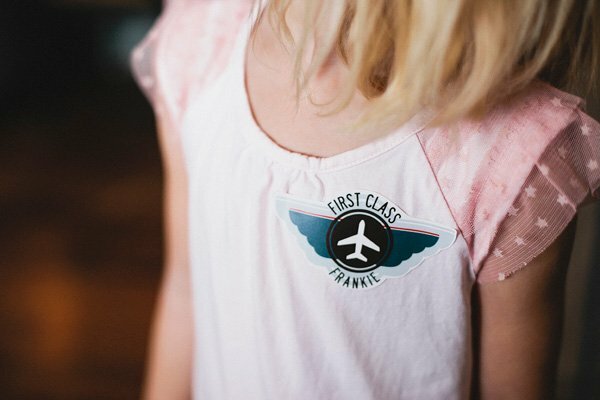 The favors were plastic blown up airplanes – each labeled with the child’s name…and everyone wore a cute ‘sticker badge’ that said ‘First Class Frankie’. This is such a cute theme! I love all the vintage touches — even the plasticware looks like something off of Pan Am. 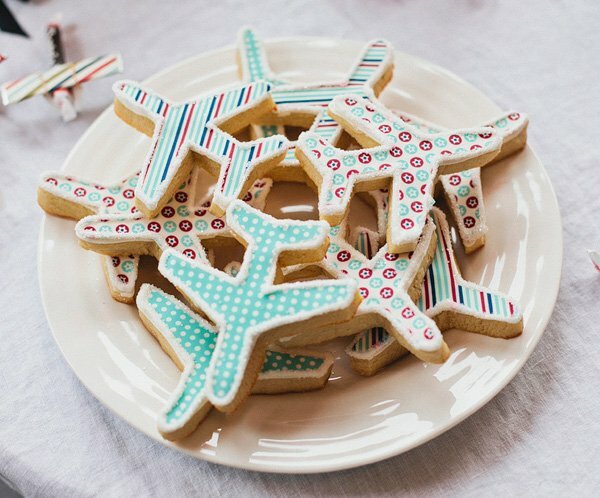 How did you do the patterned sugar cookies? Were those printed onto fondant sheets with edible ink? Love it! 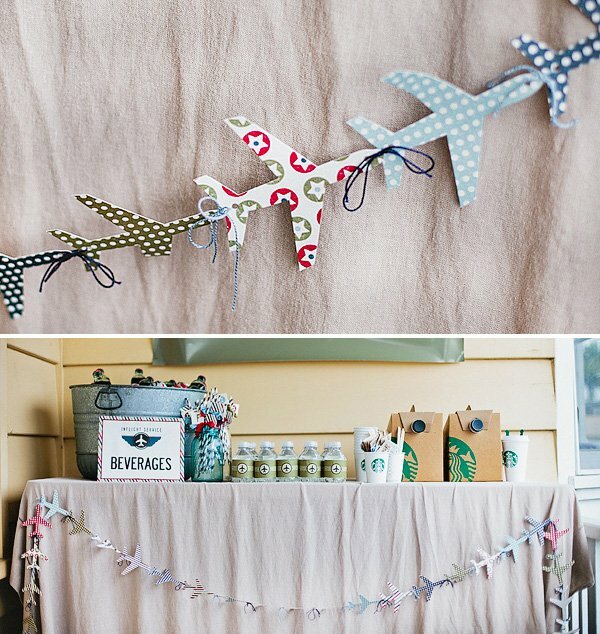 Adorable party theme… I especially like the chewing gum airplane wings! Fabulous! 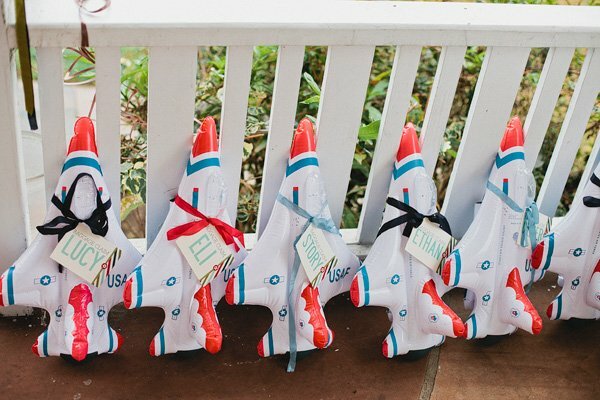 Planning my little ones airplane party so naturally I love everything about this party great job! This is so so cute. I love the aviation idea and love the colors they used. LOVELY! Where did you buy the inflatable airplanes!!! Karrie: LOVE YOUR DESIGNS. 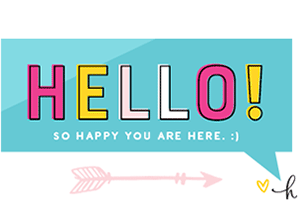 Do you have a shop where you sell your printables? 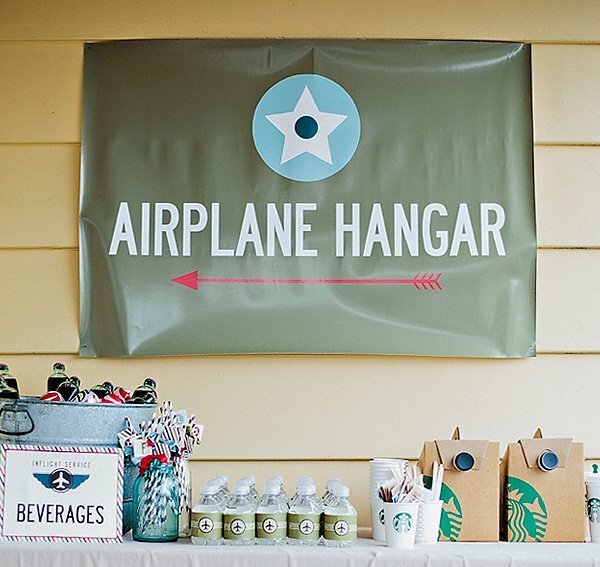 Planning a aviator theme for my son’s 3rd bday coming up soon. Thanks!! GREAT JOB ON THE PARTY! love this! 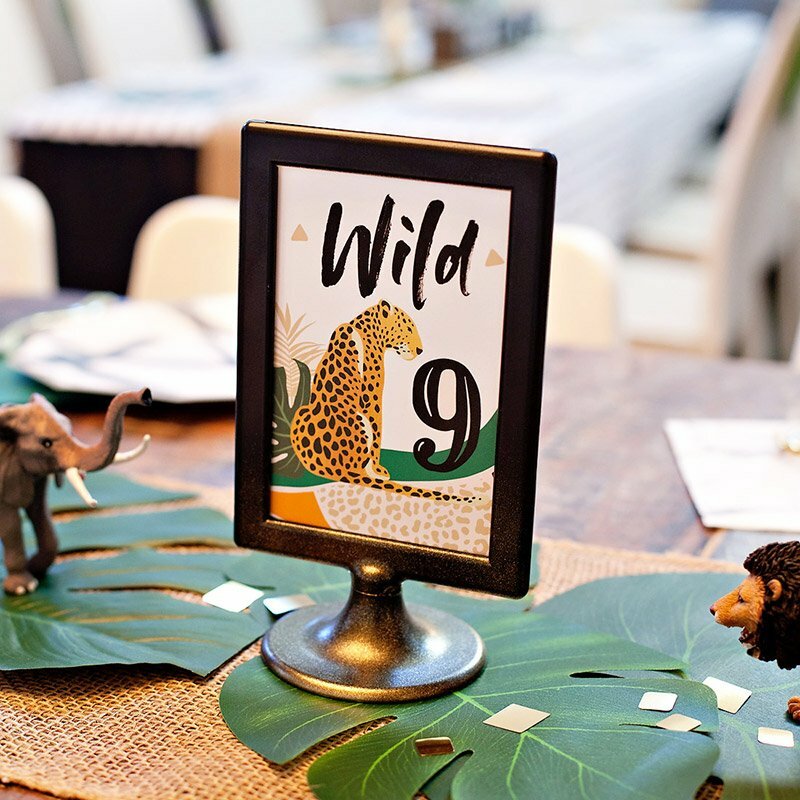 i have the same question as KARA….i’m planning my son’s 3rd bday party, as well, and would love to use the printables from this party…..are they for sale? where can i purchase them? thanks so much! Wow! I am so jealous, and I’m 23 years old! I would have loved a party like this in any one of those previous years. Did your sun have a blast? Themed parties are the best. 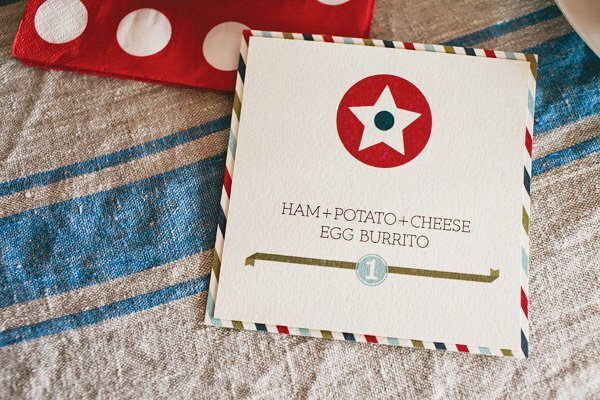 Where can I get the prints of the framed airplanes on the food table? Great Party! My little one received an adorable candy airplane.. 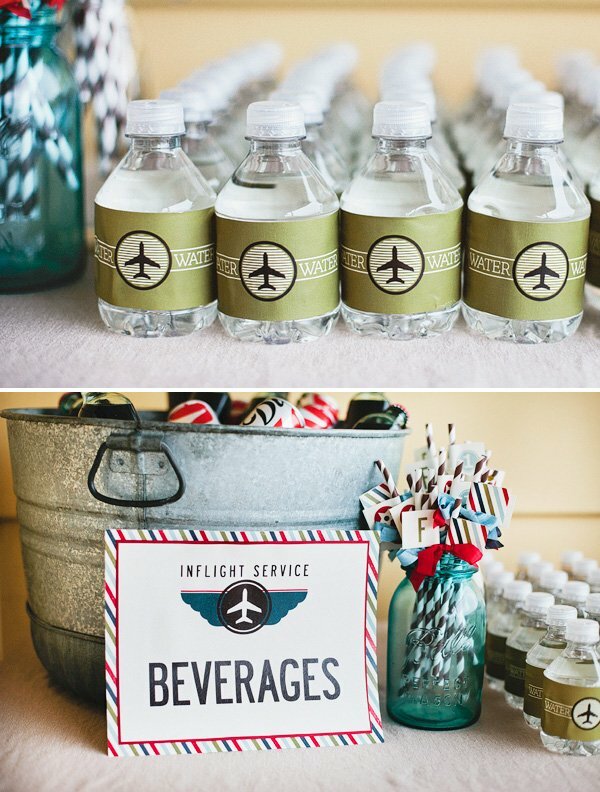 I then started looking for airplane party ideas! Yours hit the spot! My little guy turns 1 soon and I’m glad I stumbled upon your blog:) Thanks for sharing! 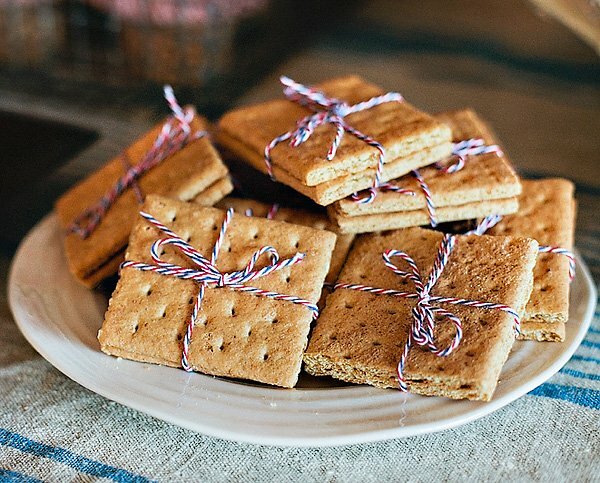 Cute birthday ideas…Amy Beaumont Felton this made me think of Olivia's party. Where might i buy the prints for this theme? 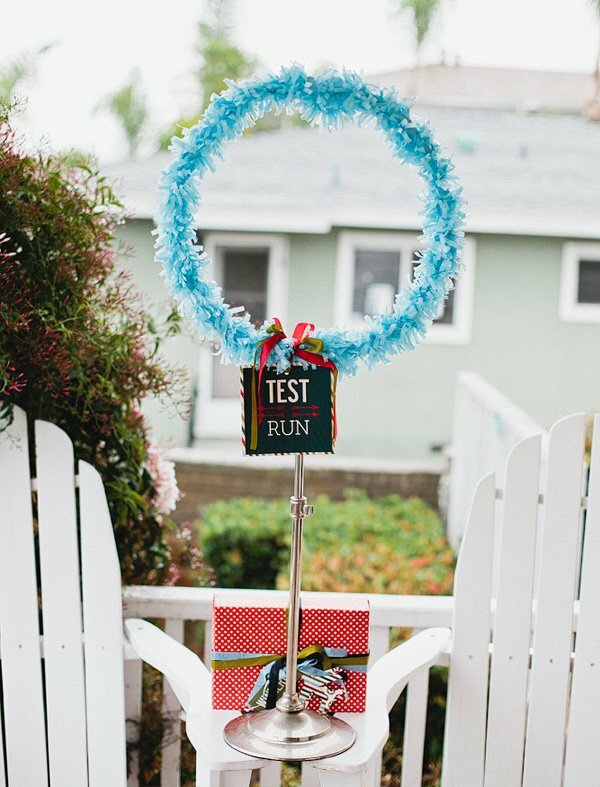 Where can I customize a similar Hanger Banner? Hello! 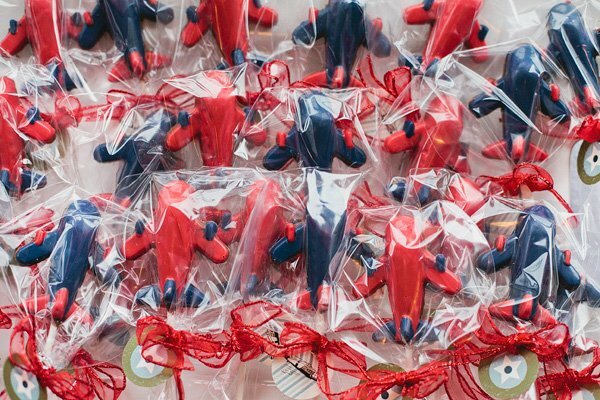 Where did you get the inflatable airplane favors? 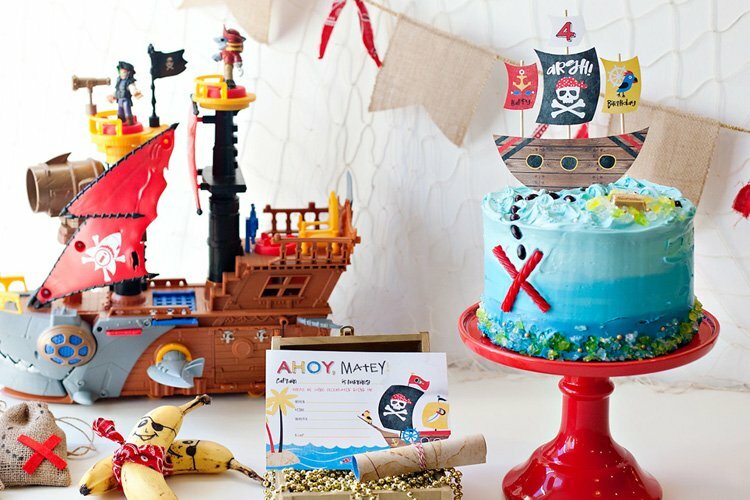 I’m doing this theme for my son and would love that to be a party favor!